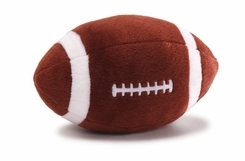 This soft plush'ball is fun to toss around and to catch. At 4" long, it's the perfect size for younger kids. Great for party favors, kids' rooms and gifts.